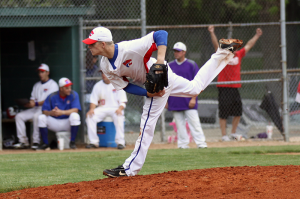 Kokomo High School senior Parker Sanburn. KOKOMO, Ind. – Not many people want to be known for following in their brothers’ footsteps. Most want to branch out and leave a mark on society that they created. But when it comes to Kokomo High School senior Parker Sanburn, following big brother is not a bad thing. On November 15, Parker Sanburn signed a National Letter of Intent to play baseball for the University of Arkansas baseball team – the same school where older brother Nolan made a name for himself before being drafted by the Oakland Athletics in the second round of the 2012 Major League Baseball draft. Sanburn said he has devoted his entire life to getting to where he is today, a college baseball signee. He said this is what he has dreamed since playing Cal Ripken Baseball at UCT. Wildkat baseball coach Tim Weeks said Sanburn is more than deserving of earning a Division I baseball scholarship. But with all of the potential for dominance, Sanburn understands he still has some work to do – which his coach points out on a regular basis. Sanburn credits his time on the tennis courts with helping him on the baseball field. He said the concentration needed for pitching is much like the concentration needed to hit a tennis ball. As team captain, he helped lead the Kats to a 15-6 record and a sectional championship. The squad was 6-1 in the conference and finished second to Marion. Week’s agreed with Sanburn’s assessment of his mental game. Following the Wildkat baseball season this spring, Sanburn will play summer baseball before reporting for duty in Fayetteville and Baum Stadium at George Cole Field. He said he is excited to play in the Southeastern Conference, which has produced three of the last four NCAA national champions (LSU in 2009 and South Carolina in 2010 and 2011). Last season, Arkansas – with Nolan Sanburn on the squad – traveled to Omaha, Neb., and finished third in the College World Series. The younger Sanburn hopes to lead the Razorbacks to a return trip to the CWS. And Kokomo will be ready to watch another Sanburn stand on the hill for the Arkansas Razorbacks – and hopefully on ESPN during the College World Series. This entry was posted in Arkansas Razorbacks, Baseball, IHSAA, Kokomo. Bookmark the permalink.